THE GOG BLOG by RORY SPEARS, Editor and Director of Content. Follow Rory to the KPMG PGA Championship and on Facebook, Linkedin and Twitter @GogBlogGuy. Round 1 and Round 2 are in the books at Olympia Fields and the KPMG/PGA Women’s Championship is moving along, with plenty of players under par. Leading the way is Danielle Kang, Se Young Kim and Chella Choi at 7 under par. But lurking just behind is the new #1 player in the world So Yeon Ryu at 5 under par, and Lydia Ko at 4 under par. Defending champion Brooke Henderson is at 5 under par. The day started with the first round having to be completed, since 30 players did not finish round 1 due to rain. That round was completed quickly and Round 2 went off on time. The yardage for Round 2, was pushed back by tournament officials from 6,596 in Round 1, to 6,621 in Round 2, an increase of twenty five yards. THE PAR 3 16TH HOLE of the championship routing for the KPMG/Women’s PGA Championship. That didn’t stop Kelly Shon from having her best tournament round of her career, by two shots when she carded an 8 under par 63. But her putting in Round 2, was nothing to be frustrated with as she started her second round with a 90 foot birdie, when she admits she could not even see the hole very well. Shon ended her media session by saying that her weekend game plan will depend on predicted overnight rains and the amount of wind. 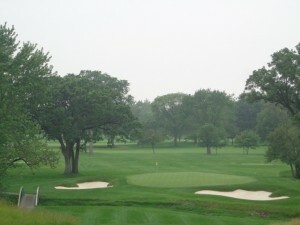 THE 12TH HOLE OF the KPMG Championship Routing on the North Course at Olympia Fields. Danielle Kang has played 36 holes of bogey free golf, and that has given her a share of the lead. The two-time amateur champion is looking for her first win out on tour as a professional. Kang has fought through a fracture of the lunate, and a problem with her back. Right now the pain is something she can deal with, as she keeps giving herself the birdie opportunities that she needs. Click here to hear interviews with So Yeon Ryu -5 and Lydia Ko -4. Henderson carded a two under par 69 to go with her first round 68, two bogeys on her front nine kept her from having a share of the lead. Michelle Wie jumped on to the first page of the leader board with a one under par 70, leaving her just three shots back off the lead. Wie opened her round with a par but made birdie on her second hole, then strung together 12 straight pars before she could make another birdie. Wie bogeyed the final hole to fall back to the three shot deficit. The cut fell at +2, and 72 players were able to stick around for the weekend. 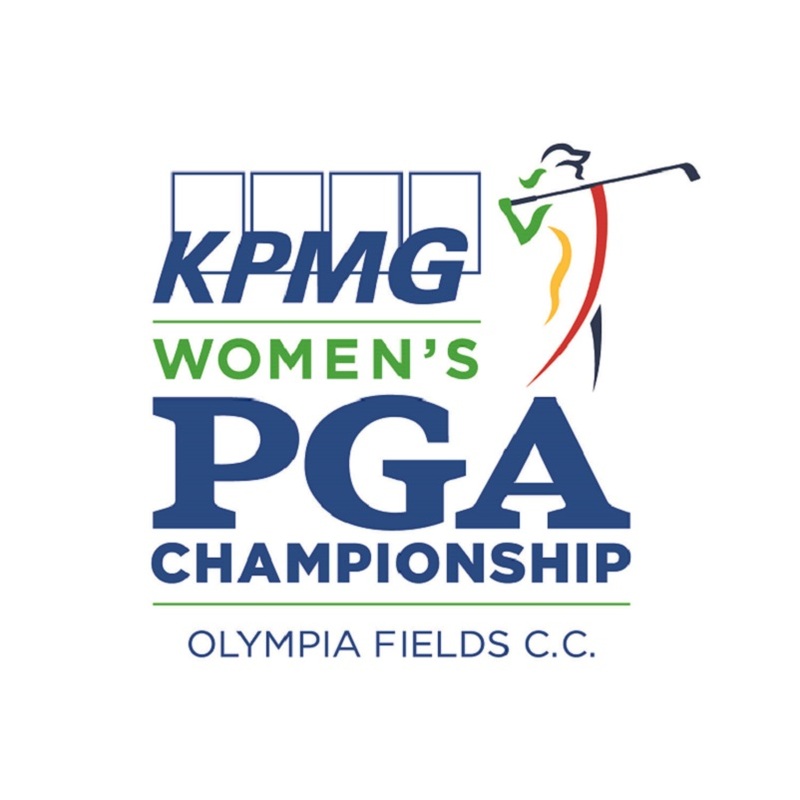 For more information on the KPMG/ Womens PGA Championship at Olympia Fields, stay clicked into this website and join us on Am 750 WNDZ at 9 AM tomorrow morning. KPMG-RD 1 SUSPENDED with 30 players needing to complete round 1. Leader is Chella Choi at 5 under par. Amy Yang is -5 through 17 holes. US SR OPEN at Salem Country Club near Boston. Illinois Coach Mike Small is T-13 after Round 1, after shooting a 3 under par 67. THE GOG BLOG by RORY SPEARS, Editor and Director of Content. 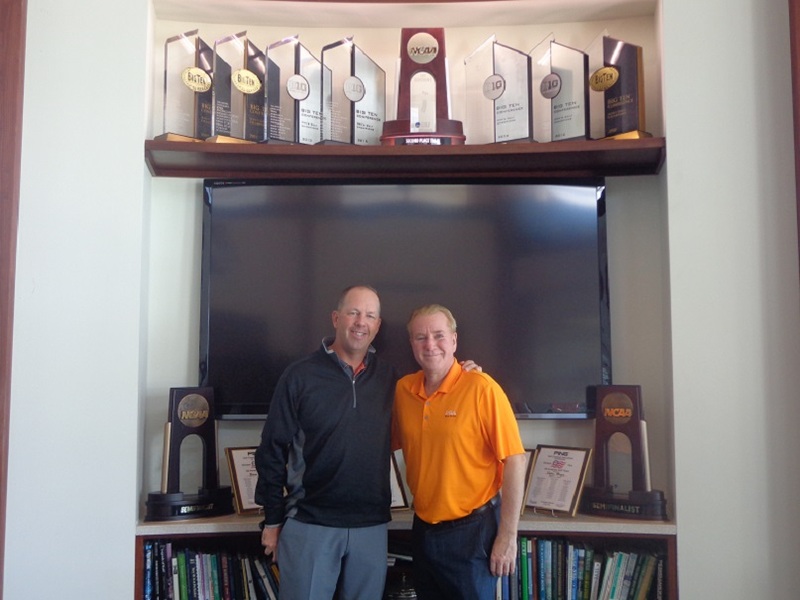 Follow Rory on Facebook, Linkedin, and Twitter @GogBlogGuy with Illinois Golf Coach Mike Small. University of Illinois Golf Coach Mike Small has qualified for the 2017 PGA Championship at Quail Hollow Country Club in North Carolina, which will be contested from August 10-13. 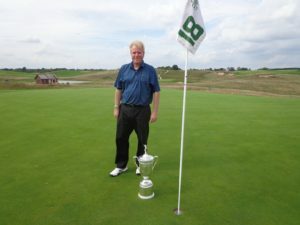 Small was one of the 12 Illinois PGA Section players who made the field of the 50th Professional National Championship at SunRiver Resort in Oregon. The top 20 players at the PNC make it into the PGA Championship and Small with a -2 score, ended up T-3. this will be Smalls 10th appearance at the PGA. 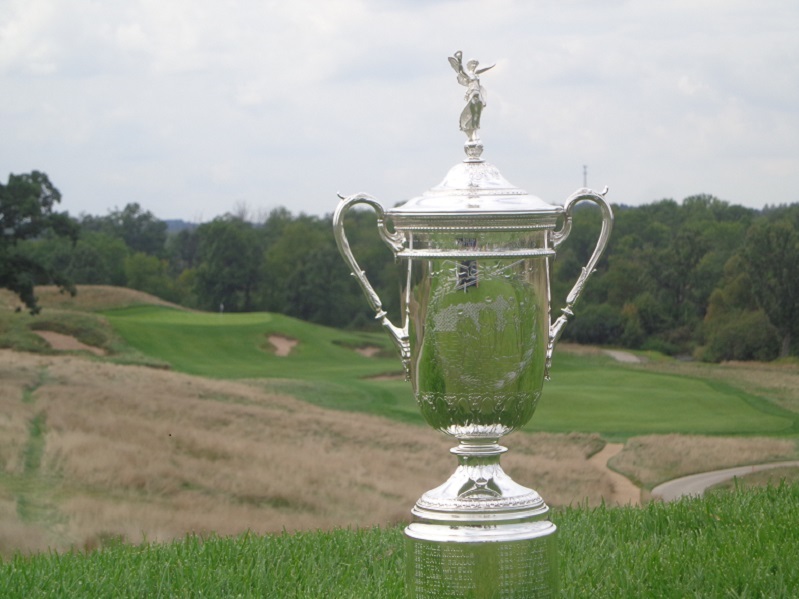 Four of the 12 Illinois PGA Section players made the cut at the PNC. the other three Illinois PGA Section members that made the cut were Jim Billiter of Kemper Lakes Golf Club, Curtis Malm of the White Eagle Country Club, and Adam Schumacher of the Indiana Hill Club. The rest of the field from the Illinois PGA was: Brian Brodell of Mistwood, Travis Johns of Medinah, Brian Janty of Exmoor Country Club, Nick Taute of South Side CC, Steve Orrick of the CC of Decatur, Matt Slowinski of Hinsdale Country Club, Doug Bauman of Biltmore Country Club, and Chris Green of the Glen View Club. Small had an excellent chance of winning his fourth PNG title, which would have been a record, but he double-bogeyed the 9th hole that hurt his chances. He did rally on the back nine and was one shot back winner of Omar Uresti, but slipped back after another bogey on the 18th hole. This week Small is competing with two other members of the of the Illinois PGA Section at the US Open at Salem Country Club outside of Boston. While Small is three under par and in a T-13 after a first round 67. Bauman and Glen Oaks head professional Danny Mulhearn both shot a 6 over par round 76. Both players are T-122. 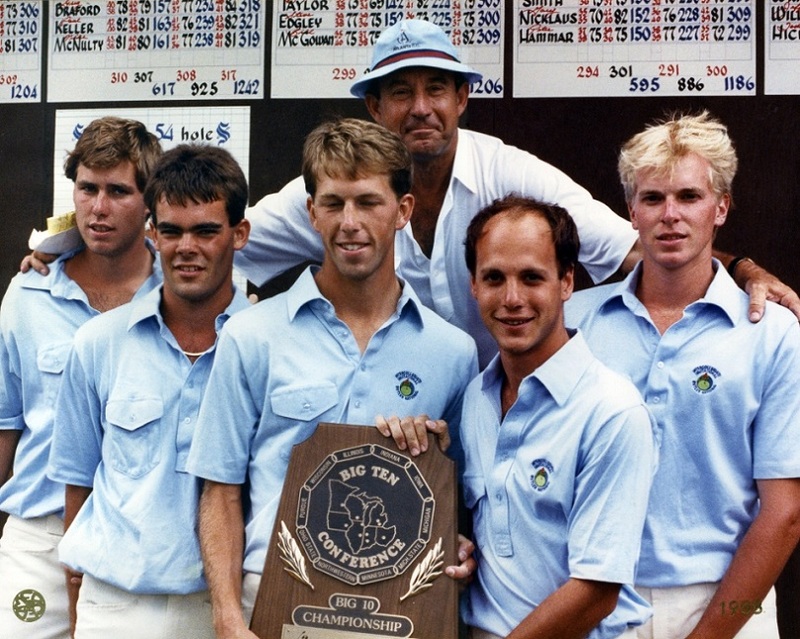 The Gog Blog returns tomorrow from the KPMG Championship at Olympia Fields. THE GOG BLOG by RORY SPEARS, Editor and Director of Content, follow Rory on Facebook, Linkedin and Twitter @GogBlogGuy. On the 17th green of the Donald Ross Course. IT’S KMPG WOMEN’S PGA WEEK at Olympia Fields, come see the top 100 women’s golfers and then another 56 players at Olympia Fields. Tickets here on site at Olympia Fields, park nearby and take the FREE shuttle over to the golf course and enjoy a day on one of the nations Top 100 rated courses. Defending champion Brooke Henderson of Canada is back to defend her title. 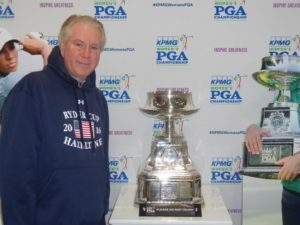 THE KPMG/Women’s PGA Championship will return to the Chicago area next year, when it comes to Kemper Lakes in north suburban Kildeer, more on Kemper Lakes in the days ahead, after the final putt falls at Olympia Fields. Stay clicked in for updates on this weeks KPMG Championship right here. THIS WEEK AT OLYMPIA FIELDS the KPMG Championship is part of LPGA major Championship series. The player that has the best combined results in the majors will win the 2017 Rolex Annika (Sorenstam) Major Award. So far this year So Yeon Ryu is the leader with Lexi Thompson in second place. To take home the award a player must win one of the five majors. Lydia Ko won the award in 2016. THE GOLF COURSE ARCHITECTURE newsletter says that a new Perry Dye course near London has been granted, planning permission. The course is part of a housing development near Edgware UK. 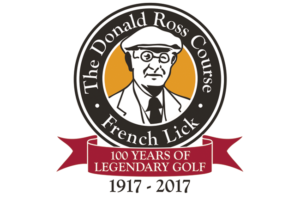 Donald Ross Characteristics will be put back in the upcoming work at Pinehurst #3, says the resort. The course will have some rerouting done to make room for the new Gil Hanse nine-hole short course. 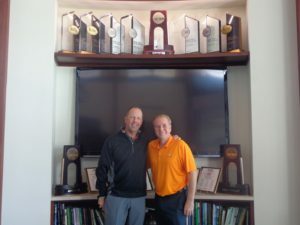 PGA Tour star Jordan Spieth will begin working on a new course for the University of Texas with architect Roy Bechtol. 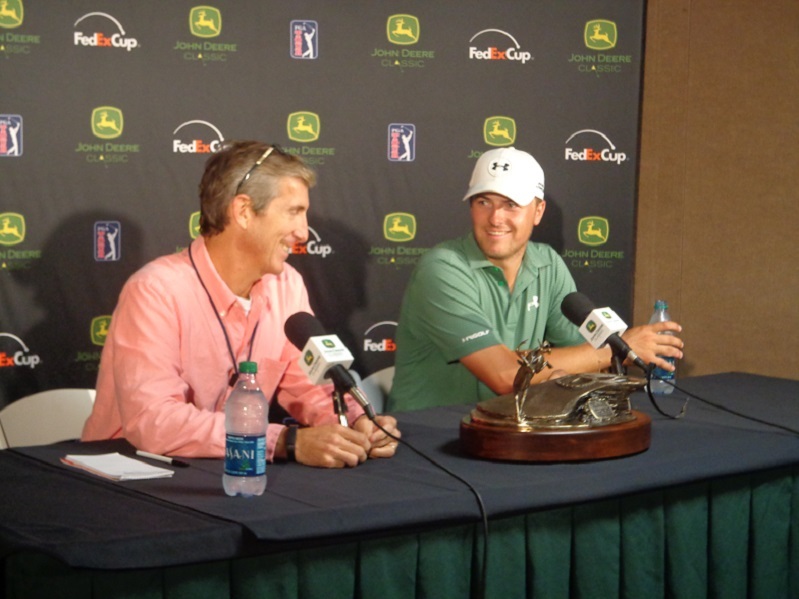 Jordan Spieth celebrates his 2015 John Deere Classic win, in his post round press conference. Jordan Spieth winner of the 2013 and 2015 John Deere Classic is not ruling out a return to the tournament this year, from July 10-16. Spieth told the Gog Blog at the US Open that the John Deere has been a successful place in the past, and it not ruling it out. “There’s a chance” said Spieth. The tournament office has just announced that Bubba Watson and Ryder Cup Captain Davis Love III have also just committed to the tournament for this year. Deadline for player entries is July 7th. For tickets see Johndeereclassic.com. TPC Deere run is an easy drive down Rt-88. THE MASSACHUSETTS Golf Association and The Women’s Golf Association of Massachusetts, have announced a merger through the Buffalo Agency. 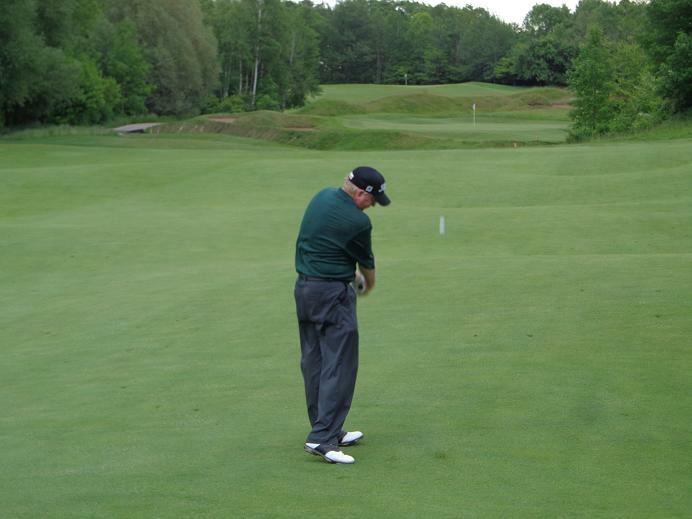 It’s a historic move for golf and golf in the state of Massachusetts. For more information please visit mgalinks.org. THE BIG A IN APPAREL ANTIGUA Group Inc. is now a participant in over 3,000 events in 2017, from professional events to amateur events, to country club scrambles, Antigua is there. Antigua is a lead sponsor for the 2017 Solheim Cup. “The event business is a very important aspect of all our business channels,” says Ron McPherson, CEO of Antigua. “Whether it’s a superbowl, a major golf event, a corporation’s national sales meeting, or an event on the professional tennis circuit, Antigua is there to provide customized products and services, on time and through completion.” For more information see Antigua.com or ShopAntigua.com. BIRDIES, BREWS and BBQ on Friday August 25th with a shotgun start at 1 Pm at the Glenwoodie golf Club in Glenwood, benefits the First Tee Program of the Greater Chicagoland. Save the date. Live music after golf. 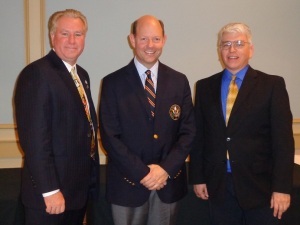 JAMEY LEWIS elected 23rd President of the Southwest PGA Section. Lewis is the PGA General Manager and Director of Golf at the Sun City Country Club. The new secretary is former Medinah head professional Mike Scully, who serves as Director of Golf at Desert Mountain. 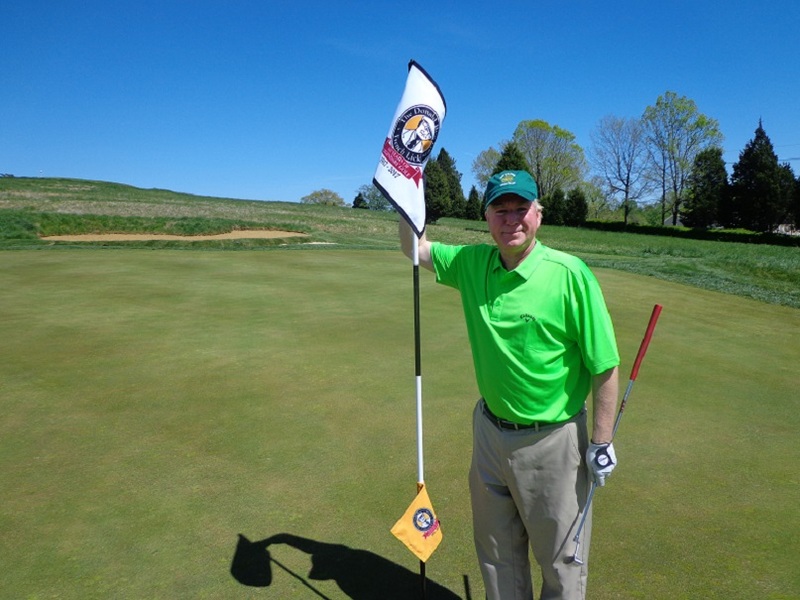 Former Illinois PGA Executive Director Michael Miller currently serves in the same capacity in the southwest section. 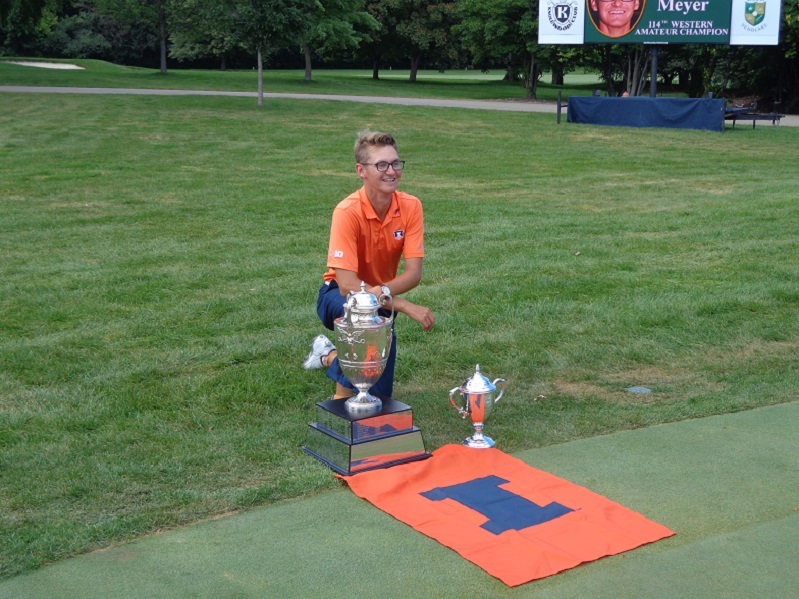 UNIVERSITY OF ILLINOIS STANDOUTS Dylan Meyer and Nick Hardy have been named to the PING NCAA All-American team. Meyer was selected to the First Team, while Hardy was named to the Second Team. ARLINGTON HEIGHTS native and member of the University of Texas golf team Doug Ghim was named to the second-team along with Hardy. THE 98TH CDGA Amateur moves into Indiana. It is the fifth time in history the championship has been played out of state. The field is 76 golfers at the Briar Ridge Country Club in Schererville Indiana. The championship has now completed the stroke play part of the championship and moved on to the match play. The four remaining finalists are Kyle Slattery, Patrick Mudd, Drake Bushong and Michael Fastert. the championship match will be played on June 30th. TOP TEACHING PROFESSIONAL RANDY HENRY will be joining Overload Golf. Henry is currently the lead instructor for the Golf Channel Academy at Hayden Lake Country Club in Northern Idaho, and he plans to open a new million dollar facility later this summer. For more information on Overload Golf please visit overloadgolf.com. THE MSOP the Major Series of Putting comes to Cog Hill on Sunday June 25th. This is a 9-hole qualifier. 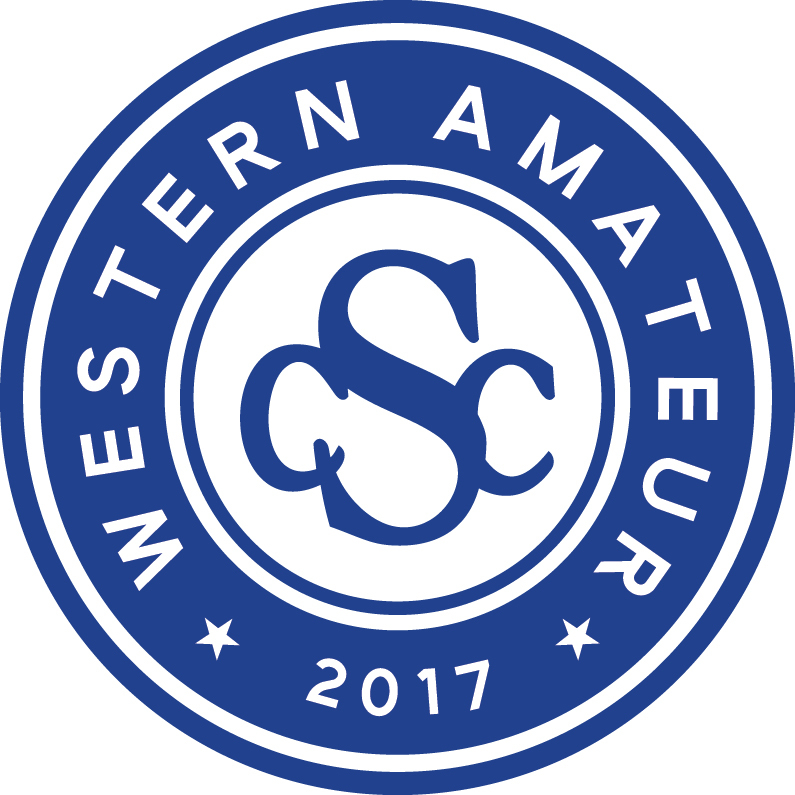 It is open to golfers 21 and over to try an earn a berth in the MSOP championship in Las Vegas. The competition runs from 11 Am to 3 Pm. You can register on line at msop.com/Chicago or do it on site. ROCCO MEDIATE and John Daly are among six players who will use the new verticle grooved river at this weeks U.S. Sr. Open at the Salem Country Club in Salem MA. for more information on the new Verticle groove driver see vertgolf.com. Erin Hills site of the 2017 US.S. Open will reopen for publiv golf this Saturday July 1st. The Erin Hills pro shop is already open for business and there is a limited amount of U.S. Open merchandise still on sale. Erin Hills will remain open until October 29th this season and the course is taking tee times for 2018. The best way to book your tee time is on the phone, who needs the hassle of trying to do it on line. 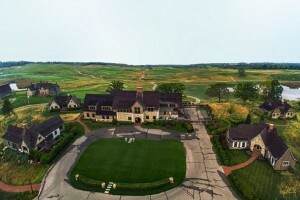 Call Erin Hills at (866)-772-4769. 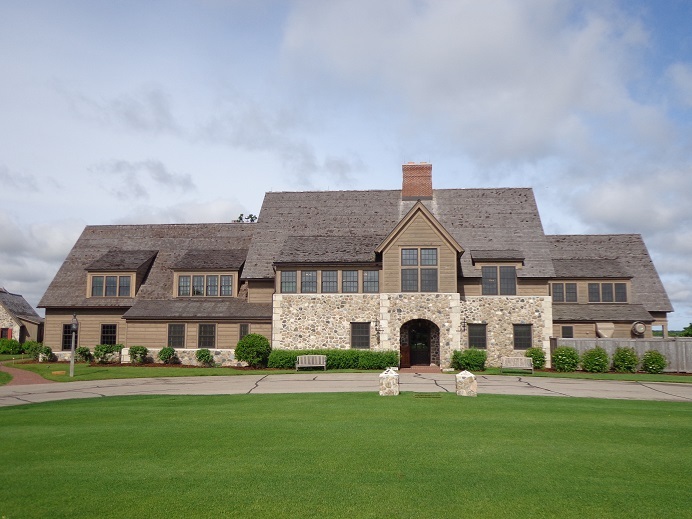 LINKS CAPITAL ADVISORS AND Chris Charnas have confirmed the sale of the Nippersink Golf Club and Resort in Wisconsin has been sold. LCA has announced that Weaver Ridge Golf Club in Peoria IL. has had it’s sale priced reduced to $3.5 million. For more information visit Linkscapitaladvisors.com. THE GOG BLOG returns on Thursday. THE GOG BLOG by RORY SPEARS, Editor and Director of Content, follow Rory on Facebook, Linkedin and Twitter @GogBlogGuy. Defending champion Brooke Henderson of Canada, heads up a powerful field for the 2017 KPMG Women’s PGA Championship at the Olympia Fields Country Club, in south suburban Olympia Fields. For the second straight year the top 100 players in the world are in the field of 156 players. Tee times begin in the 7 Am hour on Thursday for Round 1, and on Friday for Round 2. Television coverage of the championship that will be contested on the clubs North Course, will be three hours on Thursday and Friday on The Golf Channel. On the weekend the coverage moves to NBC from 2-5 PM CST, but will run over on Sunday if there is need for a playoff to determine the champion. EARLIER TODAY KPMG and the PGA announced an extension of the championships contract until 2023. Starting next year at Kemper Lakes in north suburban Lake County, the purse will jump from 3.5 million to 3.65 million. 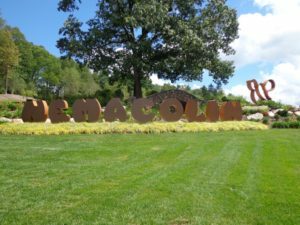 The 2019 Championship was also announced and will be contested at Hazeltine National Golf Club in Chaska Minnesota, that hosted the 2016 Ryder Cup. SO YEON RYU is now the new #1 women’s player in the world and the official #1 bib will be handed to her and her caddie before teeing off for the championship. Joining Henderson in the field are all Top 100 rated women’s players in the field. From that list are players like Lexi Thompson, Christie Kerr, Ariya Jutanygarn, Stacy Lewis, Inbee Park, Paula Creamer and Michelle Wie. The KMPG field has 26 players that have won major championship, that comprise a total of 53 major championship victories. THE PGA and the LPGA have created a ticket sharing program that allows fans of the KMPG Championship to attend the inaugural Thornberry LPGA Classic next week (July 3-9), fans with tickets for the LPGA event in Green Bay can visit the KPMG Championship at no charge. Fans must present their tickets at entry to gain entrance. All ticket types get a 1-day grounds access pass. 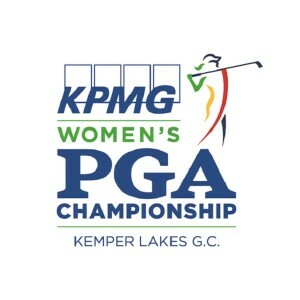 For more information on getting tickets please visit KPMGWomensPGA.com or call (708)-996-0370. 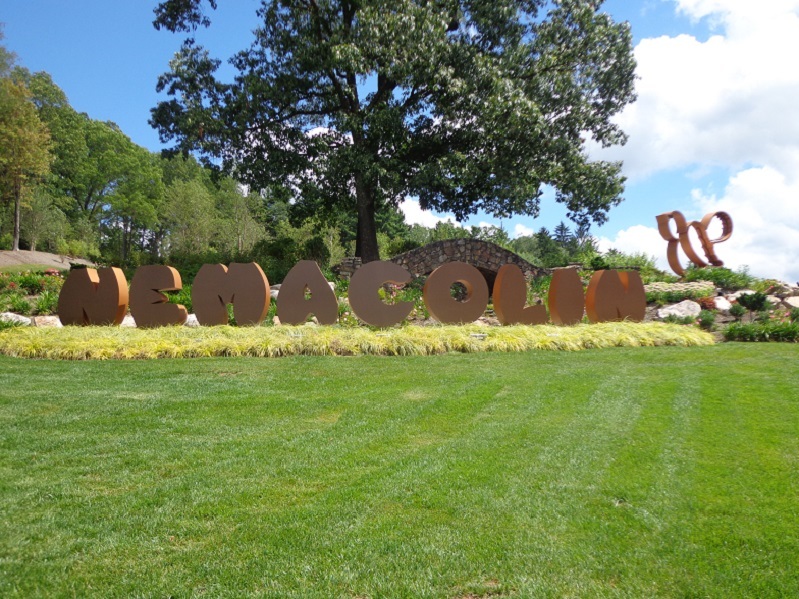 Normally hole #3 on the OFCC North Course, but for KPMG Championship week it will play as #12. For Wednesday the course will used for practice rounds for the players, gate hours are from 7 Am to 7 Pm. With gate hours reopening on Thursday at 7 Am, and running through 8:15 Pm. For championship merchandise the golf place to go is Olympia Fields pro shop. Anything fans wish to purchase can be found there, and fans with all levels of tickets can enter. Fans can visit the KPMG inspire greatness timeline, a 150 foot wall near the main entrance, a chance to honor those who have inspired today’s women’s leaders. KPMG Social Zone gives fans a chance to post their favorite photo’s of the day and a chance to win prizes. Post with #inspiregreatness or #KPMGWomensPGA. NEED MORE got to the “Go Like a Pro” Lesson zone, get the chance to try out new equipment and get free lessons from PGA and LPGA teaching professionals. On Friday LPGA World Golf Hall of Famer Pat Bradley will beat the zone. Don’t miss all the action this week at Olympia Fields, and come out to see 156 of the top women’s players in golf battle for the trophy and the honor of winning a major championship. This weekend hear from the players during Golfers on Golf Radio on Am 750 WNDZ from 9-10 Am. The Gog Blog returns tomorrow. THE GOG BLOG by RORY SPEARS, Editor and Director of Content. Follow Rory to Olympia Fields and this weeks KPMG Championship, and on Facebook, Linkedin and Twitter @GogBlogGuy. IT’S here. KPMG/PGA/LPGA Championship week at Olympia Fields is on the tee. Several golf greats started the week with skills competition on the 8th hole of the South Course at host club Olympia Fields. KPMG Ambassadors Phil Mickelson and Stacy Lewis, along with defending champion Brooke Henderson, and star Lydia Ko. A great afternoon was had by all, as this week of major championship golf, and a seminar for the benefit of women got underway. After the competition both Henderson and Mickelson spoke with the media. Click here to hear interviews with KPMG defending champion Brooke Henderson (1st) and then Phil Mickelson. This week at 150 of the top female professionals will descend on the Olympia Fields Country Club for the 2017 KPMG PGA Championship. 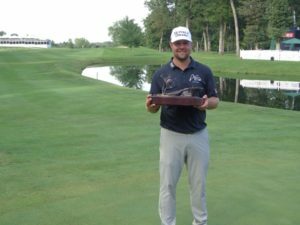 In 2018 the championship will remain in the Chicago area when it moves north to the Kemper Lakes Golf Club in Kildeer in north suburban Lake County. In addition to Henderson, Lewis and Ko, other top players in the field do include. Na, Yeon Choi of Korea, Paul Creamer, Charley Hull, Christie Kerr, Brittany Lang, Belen Mozo of Spain, Gerina Piller, Morgan Pressel, and Lexi Thompson. 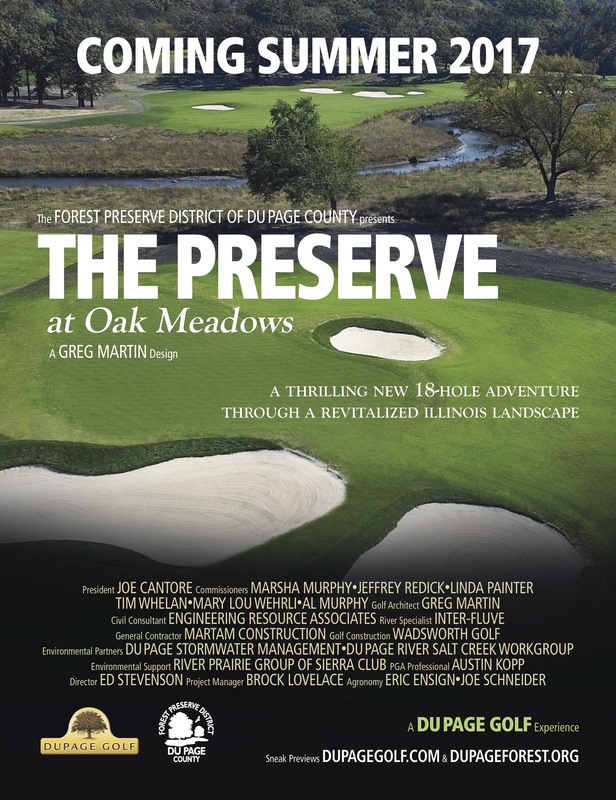 Tickets are on sale on line or at Olympia Fields Country Club. Round 1 is Thursday with the final round wrapping up on Sunday afternoon. There is television coverage all four days with Thursday and Friday on The Golf Channel, and on the weekend on NBC. The Gog Blog returns with a full review of the KPMG Championship on Wednesday. The John Deere Classic is getting ready to approach the first tee of the TPC Deere Run Golf Course, from July 10-16. Defending Champion Ryan Moore is expected to be back from the injury that kept him sidelined out of the U.S. Open, to defend his title won last year. There is more good news coming from John Deere as the field keeps getting stronger every week. Kevin Kisner a recent winner at Colonial Country Club and Si Woo Kim who won The Players Championship at Sawgrass are early commitments. Past champion Brian Harman winner at Wells Fargo and runner up at the U.S. Open will join the field as well. DYLAN MEYER defending champion in the Western Amateur and University of Illinois standout, and Ryan Moore 2016 John Deere Classic Champion will be part of the 2016 JDC field. Two past U.S. Amateur Champions Kelly Kraft from 2011 and Erin Hills, along with 2015 champion Bryson DeChambeau from Olympia Fields will play this year. In the Illinois contingent in addition to Meyer is Steve Stricker, sponsors exemption Nick Hardy now headed into his senior year at Illinois. Alum’s Scott Langley D.A. Points and Brian Campbell. Two other playing just moving on from their NCAA days, include Stanford’s Maverick McNealy of Stanford and Wyndham Clark of Oregon. Some of the past champions at John Deere include, JDC board member Zach Johnson (2012), Jonathon Byrd (2007) and Sean O’Hair (2005). More recent commitments include Daniel Berger winner at Memphis and Charlie Hoffman who contended at the US Open, and was the winner of the 2016 Valero Texas Open. Some 25 players in the field at Erin Hills for the U.S. Open at Erin Hills, are expected to play in the John Deere Classic. The new purse that gives the winner $1,000,000 for the first time in tournament history, and a new plane that will take the British Open players over sea’s in style, should continue to bring in more top players as the deadline approaches. “The John Deere Classic is thrilled to have a great mix of elite veteran players and young players coming to TPC Deere Run to compete on a great golf course in front of tremendous fans,” said tournament director Clair Peterson. More players can commit up until July 7th. For more information on the John Deere Classic, visit Johndeereclassic.com. THE GOG BLOG by RORY SPEARS, Editor and Director of Content. Follow Rory to The Irish Course at Whistling Straits, and on Facebook, Linkedin and Twitter @GogBlogGuy. NO GOLF SEASON is complete without new products coming on the market, right in the middle of golf season. So if your ready to make some changes on the fly, now might be the time. A chance to look at some of these products will be this Saturday at Cog Hill when there is a last minute Fathers-Day demo day. In the mean time here is some of whats coming out right now. It’s starts with the folks at Callaway Golf, who are already having a great year with the launch of the HOT new Epic Driver. Now from Callaway with their purchase of OGIO Products earlier this year, OGIO is now fully connected into the Callaway family, so check out the line of golf bags, travel products and coolers. TITLEIST has introduced a new line of stand bags that are now available for purchase. The new designs are lightweight with an advanced stand and strap systems. The new collection of bags includes the Players 4 bag, Players 5 bag, Players 14 stand bags. There is now a Players 5 StaDry model for golfers not afraid to play in the rain. A new valuables pocket completely waterproof will add even more to the Stay Dry bag. The Players 4 bag ($195) comes in 12 color combinations, Players 5 bag ($220) comes in nine colors. Players 5 StaDry ($225) comes in four color combinations, Players 14 is available in seven color combinations ($325). For more details see titleist.com/golf-gear/bags. SCOTTY CAMERON/TITLEIST has expanded his list of Cameron and Crown new four new models for 2017, available this Friday. The putter are designed and cut to 33 inches, perfect for the golfer requiring or comfortable with a short putter. The four new models include the Select Newport, Select Mallet, Futura 5MB and the Futura 6M. Cameron and Crown costs are US MSRO $410 and MAP $379. Scottycameron.com. Champions Tour player John Daly won his first Champions Tour event, winning the Insperity Invitational, with the new Vertical Groove Driver. It was Daly’s first win in America since 2004. 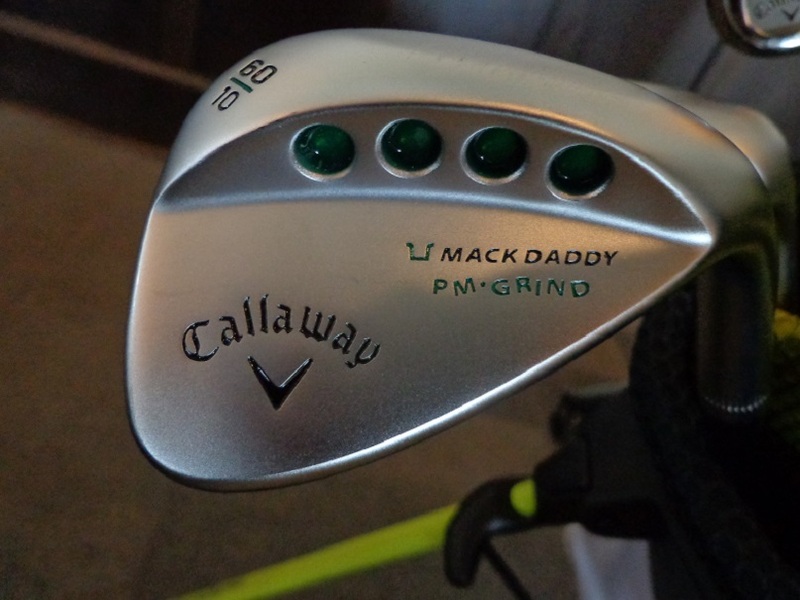 The driver on the market since late 2016, was first played on the Champions Tour by Rocco Mediate. While Mediate didn’t win the tournament he did lead the field in driving accuracy at more than 90%. 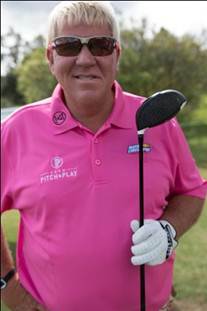 Daly said that he didn’t hit his irons very good in rounds 2&3, so he left his week be decided by his driver and putter. Daly said his win was “not pretty” but in the end he got it done and that is what matters. The Vertical Groove driver claims up to 40% straighter ball flight, and 10 yards longer off the tee. The club is now available in both left and right handed models, and has lofts of 8, 9.5, 10.5 and 12. It’s standard shaft is an Aldila NV2K, options in shafts include the Fujikura and Mitsubishi shafts. 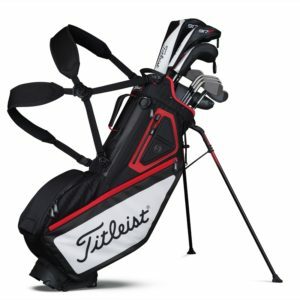 Suggested retail is $399.00 See more Vertgolf.com for more details. THE BIG “A” in apparel Antigua has announced it’s Spring 2017 Windwear Collection. Starting with the “Adavnce” a long-sleeve, half zip pullover, that works as windshirt but includes a waterproof fabric that keep one dry from light rainy weather. It’s style and lining allows for great flexibility. Another part of the collection, includes the stylish “Tour” design, which is short-sleeve pullover windshirt with a half-zip placket, and multiple pockets. It’s lightweight mesh fabric, allows for that breathe of fresh-air when you need it. Want less !, yes how about “Conquer” a sleeveless model with comparisons to Tour, and like Tour has a fabric and style that allows for wear on and off the course, and looks fashionable in any setting. TO FIND ANTIGUA online see Antigua.com, or ShopAntigua.com. To visit Antigua on social media see facebook, twitter or youtube. Miura Golf has launched a new driver called “Hayate” that does translate to “the sound of the wind”, says Bill Holowaty, COO or Miura Golf. Holowaty says that Miura has worked hard to create a forged excellence for golfers who don’t have consistent ball striking in their game. Shinei Muira, son of clubmaker Katsuhiro Miura (the company founder and legendary designer since 1957) has now created a driver and and family of fairway woods that the Muira family is proud have it’s name on. This new driver will increase ball speed and provide launch characteristics for golfers of every level. Now complete with a floating weight structure, that allows for up to 8 grams of movable head weight. The clubhead’s style is a matte black crown finish, and can be purchased in a 9.5 or 10.5 degree of loft. It’s price will vary depending on the shaft of your choice. Miura CB 2008 Irons for all levels of golfers. The new Miura CB 2008 Irons, are forged Irons that all levels of golfers can play, as the concept being introduced by Miura is that improvements in technology can help golfers of all skill levels. The process now being used at Miura’s Himeji factory in Japan, is one where soft carbon steel integrates into a forged face. As a result the sweet spot power bridge is integral to the process. The 5-8 Irons have one form of pocket cavity, while the 9-Iron and PW are one piece forged. The Cb 2008 creates a deeper center of gravity, that gives the player more forgiveness, an option all golfers will enjoy. Each Iron is $339.00 MAP. NEED MORE, well Miura didn’t stop there. How about two new Irons to the Miura Golf (MG) collection. First is the CB-1008 cavityback, and the MB-5005. MIURA CB-1008 Cavityback Iron $279.00 MAP. The CB-1008 has been created from a billet of soft carbon steel. It’s wider sole (19mm) on the 7-Iron will add to the clubs playability and it’s forgiveness. The new weight distribution in the sole, combined with a lower center of gravity, will allow for forgiveness and increased launch angle, found especially in the mid to long Irons. The CB-1008 is MAP $279.00 per club. For more information on Miura the staple of golf equipment in Japan for 60 years, please visit MiuraGolf.com or on social media follow Miura on Facebook, Twitter or Instagram. ERIN HILLS WILL REOPEN ON JULY 1ST FOR PUBLIC PLAY AND STAY. IT’S IN THE BOOKS, call it a wrap or just plain over. The 2017 U.S. Open is in the Brooks (Koepka) that is, and the first U.S. Open in the Midwest in 14 years is complete. Brooks Koepka is the winner, and the seventh straight major winner, to be a first time major winner. Koepka tied Rory McIlroy’s record of 16 under par, to have the lowest winning score in U.S. Open history. Congrats Brooks, you earned it. This years open had more rounds under par than any open ever, breaking the record of 124 set at Medinah in 1990. It also marked the first time since 1993 that neither Phil Mickelson and Tiger Woods were not in the field. Not sure how much they were missed if at all. Former John Deere Classic Champion Brian Harman bidding to win his first major, and become the first left-handed player to win the U.S. Open, fell short during the back nine on Sunday when Koepka went on a birdie binge. Harman finished T-2. Koepka’s score of 16 under par has raised some eyebrows about the toughness of Erin Hills, was it set up the right way for a US Open, does it deserve one more chance, or will the USGA never bring the men’s US Open back to Erin Hills again. Per Mike Davis the Executive Director of the USGA and the man who oversee’s the US Open, it will take a few weeks for Davis and his team to pour over all the data they have, but at some point the numbers will tell if Erin Hills is back again as a U.S. Open future site or the main U.S. Open location in the Midwest. The USGA will work with Golfers on Golf Radio and try to make Davis available for interview at some point this summer, and give him a chance to put his swing on a full recap of open week. 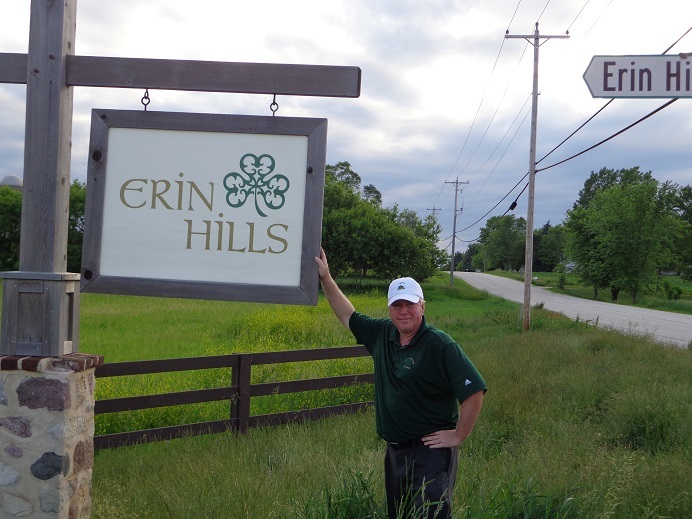 I spent six days at Erin Hills this past week and never thought that the winner would be 16 under par, not even as the wind blew hard in the morning hours of Fathers Day and Sunday at the U.S. Open. I do believe Davis when he says, both he and the USGA are not obsessed with even par winning the championship. If they were, there would not have been 60 yard wide fairways this past week. Granted both Davis and his team were working with a new venue (one Davis signed off on to make it happen), and anytime your in that situation there is a learning curve. With that issue to deal with, Davis and crew error’d on the side of caution, as the USGA didn’t need a circus at the open for the third straight year, and they didn’t have one. Maybe Erin Hills should get a trophy ! The good news is that there wasn’t a controversy this year over rules or bad greens. There were no major rules issues, and greens were just fine thank you. There was a few off the courses issues that you can not blame on the USGA. There was a blimp crash, the pilot was the only person on board when it went down about a half mile from Erin Hills. The blimp had no connection to the USGA or Erin Hills, the pilot has some burns on his back and legs, but they are not considered by doctors as life threatening. A 94 year old man passed away on Friday during Round 2, he was given immediate medical treatment, and received it more likely faster than he would have at home. The fan died in an on course ambulance. Perhaps at 94, it was just his time to go play a course like Erin Hills in sky. All of us at Golfers on Golf send his family and friends our condolences. There was a water issue at one hydration station, some E-Coli was found and the USGA moved in right away to address the problem. They also released the information of what happened to the media, before the media even knew what happened. The USGA PR department gets an A+ here. I got a chance to speak with Steve Stricker and Jordan Spieth, and both did make it clear that the players they were speaking with, on a whole liked the golf course. A factor that Davis said would be taken into consideration. I have to believe if Stricker and Spieth are getting the kind of feedback they said they were, Erin Hills will get another U.S. Open. The question remains if Erin Hills and maybe Oakland Hills in Michigan become the front runners for Midwest U.S Opens, it doesn’t bode well for the USGA to bring an open back to Chicago anytime soon. There are some factors involved here that most media outlets aren’t reporting. 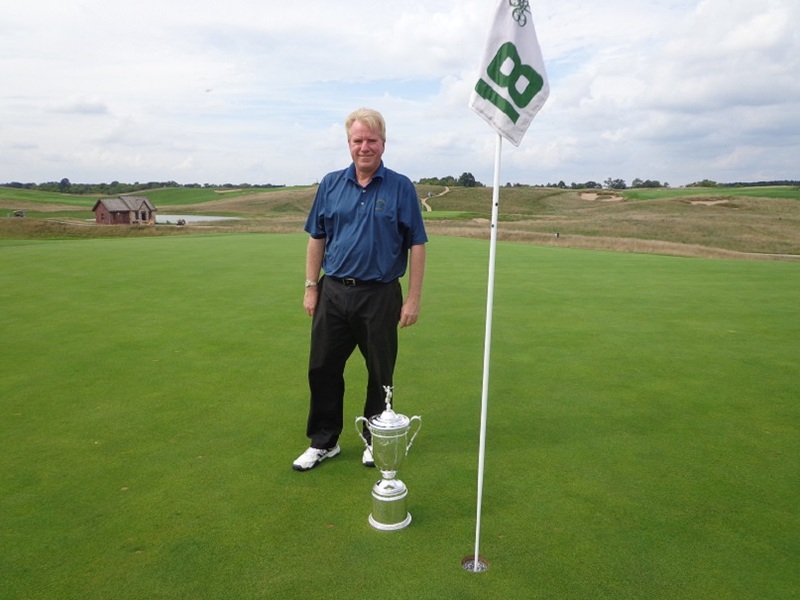 The players and the USGA loved the fact that Erin Hills owner Andy Ziegler did not open the course for public play before the championship in 2017. A first for the U.S. Open, which led to the field having maybe the most pristine course in open history. Something that can help the scoring as well. Since Erin Hills isn’t running carts down the fairway everyday either, really reduces the wear and tear on the fairways and rough. the other thing is that the players seemed to enjoy the over-sized locker room tent built for the open. There was space inside the clubhouse (unlike Chambers Bay) but the USGA elected not to use it. The short walk from the locker-room to the range and the media tent was liked by all. My view was close up since I was on site for six days in a row. I only had limited access to seeing the product on television as Fox presented it to the world. The information I have received about the broadcast still is, that Fox in year three, isn’t much better than they were in year 1 at Chambers Bay. I know many fans of golf, baseball and football are not fans of Joe Buck. 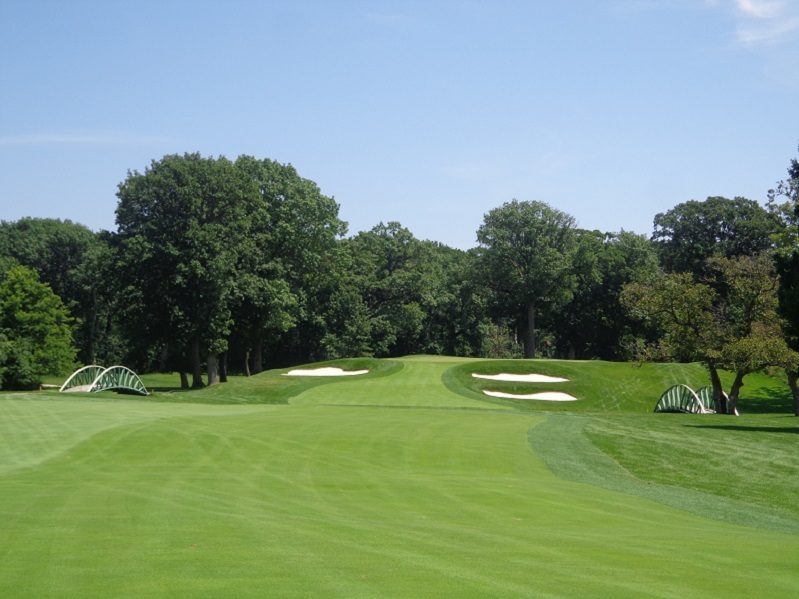 Paul Azinger gets passing grades and so does architect Gil Hanse and a few more. Holly Sonders is nice to look at (yes she is) but the majority of viewers are saying she is eye-candy and not bringing much to the broadcast. I can say that she is bringing high-heels so big and wide she can barely walk in them, it was fun to she her try and make it around the TV compound in those shoes. I’ll say this about Buck, he’s no Jim Nantz, but I’ll take him over Dan Hicks any day. It is too bad that Johnny Miller was not on-air with Fox while Justin Thomas broke Millers U.S. Open record in Round 3. THE GOG BLOG by RORY SPEARS, Editor and Director of Content. Follow Rory to the 18th green at the 2017 US Open at Erin Hills, and on Facebook, Linkedin and Twitter @GogBlogGuy. The US Open all of us here in the Midwest have for, for so long is over. Brooks Koepka with a final round 67 (-16) has won the 117th U.S. Open Championship at Erin Hills, and now it’s on to Shinnecock Hills Golf Club on Long Island in New York. But before we move on to 2018, 2017 needs a proper send off, and the stretch run during Open Sunday at Erin hills is one that will have people talking for sometime. With Jordan Niebrugge officially breaking the record of Rounds under Par at a US Open. Niebrugge recorded the 125th round under par of the week, it broke the old record of 124 set at Medinah in 1990. Right before Niebrugge finished, 2015 US Open Champion Jordan Spieth wrapped up his week with a 3 under par 69, his best round of the championship. Spieth called the round his best in a while, and said that he would play in Hartford next week. 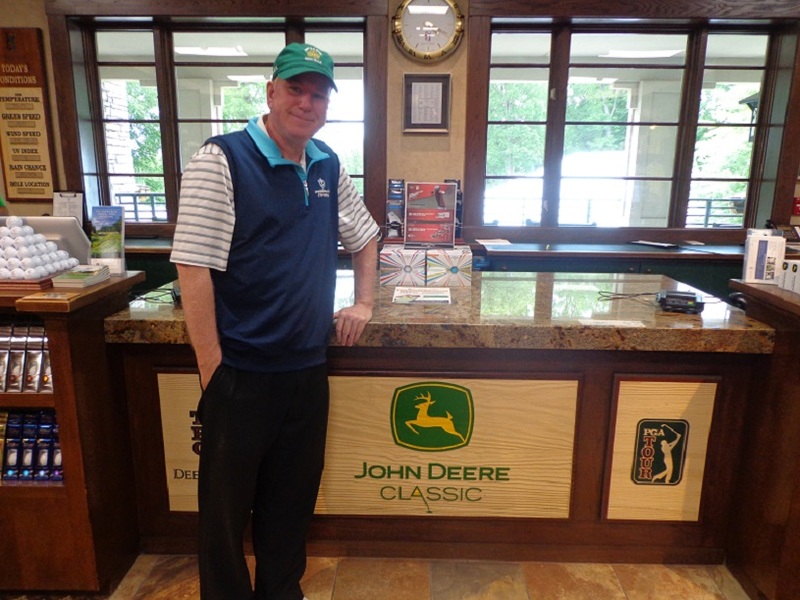 But when asked about the John Deere Classic by the Gog Blog he said definitely a chance,yeah. that’s been successful for us in the past. Spieth added that most of the players really liked Erin Hills, and supported a return to the course for another U.S. Open down the road. The leader board was bunched as the leaders made the turn, 8-10 players had a chance to win the championship. But then one-by-one they started fall back except for one player, Hidecki Matsuyama who made five birdies on the back nine to close with a 66 (-6) and a -12 for the championship. He was the leader in the clubhouse and posted the number that had to be beat. When all was over, only Koepka could. 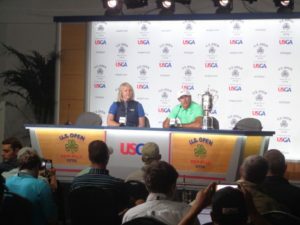 US Open Champion Brooks Koepka at the championship press conference. Rickie Fowler who started the week strong with a seven under par 65, and the early two shot lead after 18 holes never seemed to get much going after Thursday and was unable to mount a Sunday charge starting the day just two shots back. Tommy Fleetwood was another who could not muster a run to challenge Koepka as he spend his day, giving back a shot to par on holes right after a birdie putt had fallen. Justin Thomas who set a US Open low scoring record with a 63 on Saturday, had nothing left on Sunday. He bogeyed three of the first four holes and never mounted a Sunday charge. Hometown hero Steve Stricker shot his second consecutive 3 under par 69 on the weekend to finish at 5 under par. At about 4:30 in the afternoon Stricker was actually the leader in the club house, but when asked about it he joked that his score would win nothing. But as always Stricker was thankful for all the support from the fans, said he heard from many players that were enjoying the golf course. He expected the US Open to come back to Wisconsin someday. 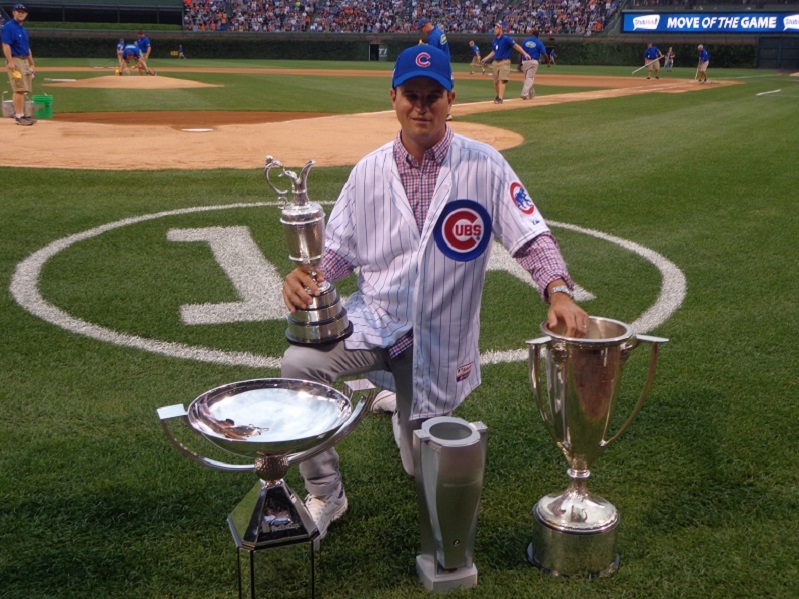 Stricker will play his American Family Insurance event on the Champions Tour next week, before taking two weeks off and then heading to the John Deere Classic and the British Open. When the dust finally settled at Erin Hills, it was all about what they say at the Masters every year. The back-nine on Sunday, when Brooks Koepka simply made more putts than anybody else. Brian Harman bidding to be the first left-handed golfer to win the US Open Championship, made bogeys on holes 12 and 13 to derail his chances. Harman’s drive on 12 found the hay, and he could not get up and down on the par 3, 13th. Harman’s last charge was a near hole-in-one on the par 3, 16th. But when the tee shot came up a foot short, all Harman could do was make birdie and trim Koepka’s lead to three shots with two holes to play. A bogey on 18 left him at even par for the round, and four shots back when it was all over. He finished T-2 with Matsuyama. While that was happening, Koepka started his birdie run to pull away. After Koepka made birdie on the par 3, 16th hole to open a four-shot the championship was basically over. With the win Koepka became the 7th straight first time major winner, and he tied the lowest final round score to par (-16) previously set by Rory McIlroy in 2011 at the Congressional Country Club. Click here to hear the championship interview with winner Brooks Koepka. The low-amateur award went to Scottie Scheffler who finished at 1 under par, beating out Cameron Champ by 1 shot when Champ’s birdie attempt from 15 feet on 18, just slid by the cup. A record number of players (31) broke par for the US Open. REPORTING FROM ERIN HILLS… Zach Johnson’s third round 68 left him in s better mood, in fact he says it was one of his best rounds of the year. He finished strong and made a solid birdie on 18 to end the day. His position on the leader board went from 50 something to 20 something. Nothing like moving day at the US Open. With the way the scores went in the afternoon, Johnson doesn’t have a chance to win the US Open this year, but he does have a chance to be in solid form by the time the John Deere Classic comes along. After winning the British Open in 2015, Johnson was playing some if his best golf since winning the Masters a few years earlier. But Johnson was one of a handful of players who jumped equipment companies at the end of the year, and he jumped to the PXG group headed up by owner Bob Parsons. But what Johnson didn’t do, was allow the Parsons people to work with him on the equipment change and make the most of it. Once he did that, the change has started to take off. Johnson didn’t make any excuses on Saturday after Round 3 at the US Open, in fact he took full blame for the rough start with PXG. Click here to hear the interview with Zach Johnson after his third round at Erin Hills. Johnson says he will play at Hartford before taking a couple of weeks off, he will be well rested as he comes into John Deere Classic Week starting on July 10th. Johnson will be looking to win his second John Deere Classic title next month, and he continues to serve on the tournaments board of directors. 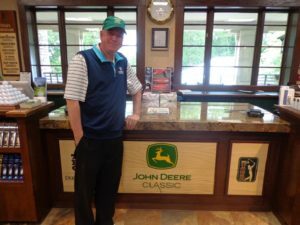 For tickets and information on the John Deere Classic, do visit Johndeereclassic.com.